A new report published by the Canada Green Building Council (CaGBC) today sets out a series of comprehensive actions for industry, non-profit organizations and governments to build a world-leading retrofit economy by 2030 that improves the performance of existing buildings and creates new economic opportunities for Canadians. CaGBC’s A Roadmap for Retrofits: Building Strong Market Infrastructure for the Retrofit Economy, was released today in conjunction with a roundtable policy discussion hosted by Natural Resources Minister Jim Carr, CaGBC and Econoler in Ottawa. The Report states that the environmental and economic potential of Canada’s retrofit economy cannot be developed by governments alone – it requires industry leadership and innovative market-based mechanisms to generate and sustain results. Today’s roundtable convened a diverse range of stakeholders to discuss how to develop the policy, financing, human capital, business practice, and information market infrastructure to build and sustain a robust retrofit economy. The Report calls on private financiers, pension funds, insurers, and other financial intermediaries to develop retrofit lending products (like the Investor Confidence Project) and standardized commercial contracts that foster building owner and financier confidence in deep retrofit projects. The Report encourages building owners to proactively disclose building energy and carbon performance, and to share data on the performance of their retrofit projects in order to help the retrofit economy evolve. An infographic of the retrofit economy. Image via CaGBC. The Report calls on governments at all levels to leverage their own significant building portfolios to demonstrate the value of retrofit projects, co-invest in education and training with industry to build skills, and undertake smart regulatory and program interventions to attract private-sector capital to projects. The CaGBC will work with government, industry and financial leaders to support the introduction of key market infrastructure that will drive an acceleration of retrofit activity proposed in the Roadmap. 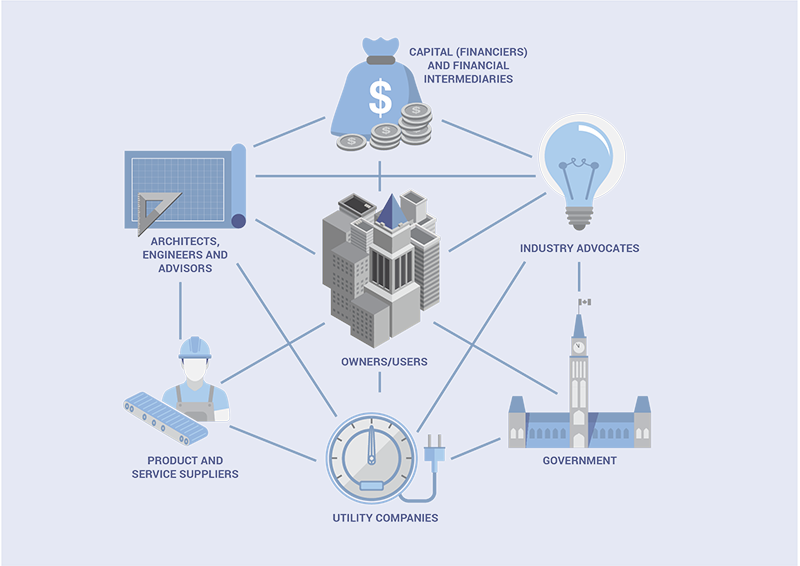 The full A Roadmap for Retrofits: Building Strong Market Infrastructure for the Retrofit Economy report is now available on the CaGBC’s website.